It’s our 20th episode of the Bit by a Fox Podcast! And we’ve decided to shake it up a little…. A couple of weeks ago I visited the 75th annual Wine & Spirits Wholesalers of America Convention at Caesar’s Palace in Las Vegas. 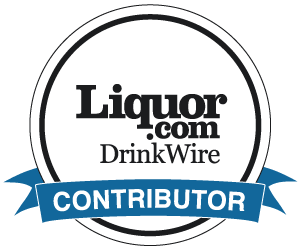 It’s the largest gathering of distributors, wholesalers and products in the wine and spirits industry. It’s where you go to see and be seen. If you’re a wholesaler or distributor, you go there to shop for new products. If you’re a new brand, this is where you go to launch, and look for distribution. It’s often a beta test for brands to see how it is reflected in the industry first before bringing it out to consumers. And it’s overwhelming. SO. MUCH. BOOZE. Over 500 exhibitors, two giant exhibit halls and massive suites turned into brand activations. It’s just a sea of products. It’s difficult to stand out amongst so much, but I found my favorites and wanted to share them with you. This is my first podcast out on the road and I had a portable mic to interview folks in their booths and it was so much fun. #FoxInTheField! Look out for these exciting new products in the coming year! I was on my way to the airport when the Brand Battle – a competition towards the end of the convention where top 7 brands battle it out – was taking place, so unfortunately I missed it, but I was sure to stay glued to social media to get the word once the winners were announced. And Gray Whale Gin took home the first place award. The buzz around the convention seemed to predict this win but I was super happy for them. In honor of their win, I wanted to share a simple cocktail of theirs for our recipe this week. Stay tuned for an upcoming episode devoted just to them.